Our Executive Gift Basket will please the retiree or whole office. We fill it with a superb selection of local fruit, such as shiny apples, juicy oranges, grapes, bananas, and nectarines. We also include a gourmet selection of sausage, cheese, crackers, nuts, cookies, and chocolates. You may choose Chardonnay or Merlot to accompany this basket. Retirement gift baskets. Perfect retirement gifts, retirement party gifts, gift baskets and gift ideas for those retiring. Help a Friend or Loved One Make the Transition by Sending A Unique Retirement Gift Basket by Adorable Gift Baskets. Retirement can be a joyful time, but also a very emotional time for someone who has worked most of their life. It's a time of transition as they close one chapter of their life and welcome a new beginning. Most retirees dream of the days ahead when there will be no daily rush, no fights in traffic, no pick-me-up morning coffee breaks to stay awake, and no clock-ins at work. With retirement gift baskets by Adorable Gift Baskets, you can help your friend, co-worker, or employee makes the transition to retirement with a smile. By sending a beautiful gift basket for retirement, you can help them celebrate this incredible milestone in their life. At Adorable Gift Baskets, you'll find retirement gift baskets of all shapes, sizes, and styles. From luscious gourmet food gift baskets to balloon and flower arrangements, there's something for everyone. If your recipient is on a medically-restricted diet, try one of our colorful fruit baskets or a basket with sugar-free goodies for someone with diabetes. For the retiree who loves sweets, you can surprise them with a delicious chocolate basket filled with chocolate candies, chocolate-covered peanuts or raisins, chocolate bars, truffles, bonbons, etc. 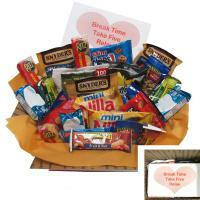 Or dazzle them with an Italian specialty basket or a coffee and tea basket. 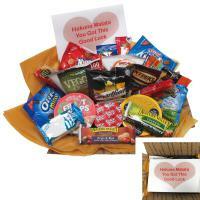 There are also flavorsome cookie baskets if you'd like to keep your gift simple! When buying a gift basket for a retiree, consider their favorite hobby. How do they plan to spend their free time after retirement? At Adorable Gift Baskets, you can browse themed retirement gift baskets that are perfect for gardeners, sports fans, golfers, readers, movie lovers, home decorators, etc. A retirement gift basket from Adorable Gift Baskets will add a sense of thanks and congratulations at their office retirement party. If you're an employer, you can show your appreciation for years of hard work by giving each retiree a retirement gift basket. Our retiree gratitude baskets contain a variety of goodies including cookies, tea cakes, pretzels, cheese spreads, coconut rings, chocolates, tea, cocoa, popcorn, and other fine treats. 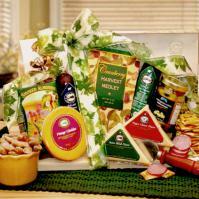 Appetizing retirement gift baskets can be delivered to your friend's home or office. These gifts provide an affordable way to celebrate any retiree's final days with a company. Retirement is a pivotal moment in anyoneÌs life. Quite often, farewell retirement parties are thrown, and gifts are given. Just as often, the gift givers struggle with the concept of what to give. How does one decide what can be given as a meaningful, useful, and desirable gift? Although this may appear to be a daunting task, a bit of simple planning and clever investigative research is all that is necessary. Money seems so cold and impersonal. Specialty food baskets, gifts baskets filled with fresh fruit, a gift box of chocolates, fresh flowers and executive theme gift towers are, without a doubt, all time favorites gifts for the retiree. If you know the person well, then you already know what it is that they are planning to do with all of this free time. This is one of the first steps to planning the perfect retirement gift. Find out the short-term goals of the person who is retiring, either through conversation with them or with their close friends or relatives. Find out the long-term goals the individual has through the same methods as above. Discover what hobbies the person has, whether these are new hobbies, and how serious the hobby is. Ferret out his cultural heritage. Learn where his or her early roots are, where he or she grew up, and where the places he or she visited are. Gifts for the Sports fan, buy sports gift baskets, unique, all star sports gifts, golf, fishing, baseball, basketball, collegiate, hockey, football baskets and gifts. Perhaps a duffle bag or backpack. 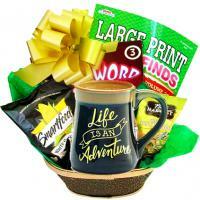 Gifts or the Fisherman, a fishing theme gift basket is perfect. Or, buy a deluxe tackle box, a few books and DVDs on fishing, and a few other assorted fishing related items. 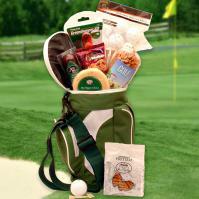 Gifs for the Golfer, purchase a golf gift basket filled with golfing gifts and golfer's theme gifts designed for those who love to play golf. For the deep sea fisherman, purchase a few tickets for excursions throughout the season. For the new part-time career, purchase items that will come in handy on the new job. For the Grandparent, invest in a few photograph albums and journals. Buy a few tickets or even a membership to a kidÌs museum or all day park. Gifts for the Gardener, select a colorful array of new gardening supplies, books, and plants. Every gardener can use replacement tools after years of use. For the person who is going to relocate, phone cards and stationary are excellent ways to keep in touch after relocating to a new area. For the computer wizard, gift certificates to local computer stores are an excellent choice. For a cultural gift, books on the cultural heritage, videos, music CDs, and paintings are nice touches for a thoughtful gift. If you are unable to gather enough information to make a themed choice, purchase a large basket and fill it with a variety of items: the newest best seller, movie theater tickets and a box of candy, sporting event passes, gift cards to unique stores, and a few gourmet food items. These not only look terrific but also, something in the basket is sure to make a hit with the person. No time to put together a gift basket for your favorite retiree? No problem! Adorable Gift Baskets offers a huge selection of extraordinary retirement gifts, gift baskets and gift ideas for retirees. Click here to view more unique retirement gift ideas.